Hot on the heels of my overview of Sepai skincare and meeting with the team in London, comes my review of the Sepai skincare products, which will hopefully give you a full picture of this Spanish beauty brand. What made me curious to explore Sepai’s story and try the products is the fact that they don’t promise to deliver miracles or instant results. Instead they say that you will need to use their products for about six months to notice a difference ( in my case I noticed subtle effect within a few weeks of use and with continued use my skin became brighter, complexion more even and pores even tinier ). We are led away by the promises of eternal youth from many skincare brands, so it is refreshing to discover the brand that doesn’t. All of the Sepai products that I tried come in dark glass bottles with practical nosels that can be turned to open and close the products, preventing unnecessary oxidative exposure of the formulas. The serum comes in a dark green glass bottle with a pipette which makes for easy application – the shade & shape of the bottle reminded me a little of the Caudalie serum & face oil bottles. Both the body and face moisturiser have smart squares on the label where you can add the names of the boosters that you might choose to add, making your skincare even more potent in addressing your current concerns ( you can add up to three ) as well as truly customisable. Sepai prides itself on focussing on the causes of ageing and taking into account that our skin is a living, constantly changing organism. With the right skincare you can certainly expect to see a difference in the quality of your skin. You can also be sure that Sepai doesn’t put any ingredients in their formulas that they know can have a harmful effect on your skin, their focus is on safety and making sure your body’s equilibrium doesn’t get disrupted. This delicate cleansing emulsion is formulated with actives that cleanse, hydrate and accelerate cellular renewal. It has a creamy texture, a flowery smell and spreads easily all over your face. You can massage it in with your fingers or use it with the face brush ( I use it with my Foreo ). It doesn’t dry the skin, quite the opposite and I say that having used it in the midst of the cold weather spell in London. This cleanser works well for oily or combination skin and can be used morning and night. In my case, in part because of its uplifting, strongish smell, I prefer to use it in the morning, to wake up my senses & head a little. I think it works well all year round, as it infuses the skin with freshness and cleanses the skin effectively. Definitely one of my favourites from Sepai range! I did say to I did Paola that I am quite fickle when it comes to toners but she clearly must have known that I will be impressed with theirs, as it was enclosed in my Sepai parcel. It has a screw on top and you have to put it on the cotton pad and spread it around your face. It is an alcohol-free product which was developed to balance and decongest the skin. Based on rose water, with the added benefits of camomile and witch hazel extract, it is a perfect partner for the cleanser in the evening, helping remove any residue before your apply your serum, moisturiser or face oil. It has a pleasant smell and somehow I attribute lesser noticeable pores thanks to this product. I use it in the evening and extend it to my neckline, as well as to clean and refresh the area behind the ears. This Bi-phasic emulsion can be used both on your face, as well as extending it to the eye area to remove eye-make-up. It is a delicate, white in colour cleanser with a light-weight consistency that is a pleasure to massage into your skin with the fingers. It contains argan oil, squalene and allantoin and cleanses the skin effectively, particularly when used in the evening ( this of course is a personal preference ). I used it when the weather outside was cold and the air inside was warm, yet my skin felt nurtured and cocooned. This product is one of Sepai’s best-sellers but it wasn’t originally enclosed in my parcel, so having done the reading, the research, as well as tried the absolutely perfect Sample Kit ( it is by far the cutest and loveliest sample kit, giving you an overview of the smells, textures and effects of the whole range of Sepai products, so if you can get your hands on it, I highly recommend it. It will probably make a grown-up woman feel the same way a little girl feels when she opens her toy princess box ) I decided to try it as well, thus having the full Sepai skincare regime experience. Paparazzi is a lightweight, anti-oxidant moisturiser that has protective, cell-repairing actives, as well as iridescent pigments to brighten the complexion. You can use it day and night and it is suitable for all skin types. Your skin drinks it up, so you can apply your make-up almost immediately. When using this moisturiser I don’t feel the need to use the primer and it is also perfect for the weekend when you want to relax and forego make-up. It is a product that nourishes & revitalises the skin while also adding soft focus to your skin. There is no shine, just a more even skin tone and increased radiance. Don’t forget to shake the bottle before each use in order to make sure that all the actives in the formula are evenly distributed, so your skin can get the best treatment. This is one of the lightest and prettiest serums I have tried. It is a clever multi-tasker that works on refining pores, repairing skin & brightening the skin, as well as being anti-wrinkle and anti-spots. Paola enclosed an Acti-C powder syringe alongside this serum, so I added it in and shook the bottle vigorously ( don’t forget to do it before using this serum ). Upon application, as if my magic, my skin feels and looks more even, refined and smooth.This serum was developed with normal to oily skin in mind and I delight in using it morning and night. It has a lemony yellow colour and smells like happiness and summer to me, even in the midst of a grey and cold day in London. A sublime product for your skin, which over time makes your skin more radiant and smooth, even when used on its own. If you don’t have eye area problems, you can use this serum around your eye area as well. While it is essential to look after your face, it’s important not to neglect your body, which sadly we at times do, only to regret it bitterly later. Sepai’s rich body moisturiser feels light-weight and sinks quickly into your skin, allowing you to nurture your skin after bath or shower and not lose time, waiting to get dressed. The body primer has a consistency of the body milk and adds a feeling of silkiness to the skin upon application. The formula itself is aimed at nourishing, moisturising, brightening and repairing your skin and iridescent particles add a healthy glow to the skin that looks lacklustre. My skin feels cooler to the touch and more even at a time when the suntan has faded thus creating an incentive to use the body moisturiser on a regular basis. Sepai combines skincare technological advances with working alongside your skin, not against it. Sepai aims to create safe & efficient skincare that addresses each customer’s individual needs by allowing customers to customise their skincare routine. The brand doesn’t make false promises like turning the clock back but it does focus on cellular longevity, protein stimulation, DNA protection, environmental defence and energy recharge. Sepai formulas are developed to work like a personal trainer, optimising your skin’s performance and functions. Sepai consciously omits using skin sensitizing ingredients or substances that don’t provide treatment for the skin. 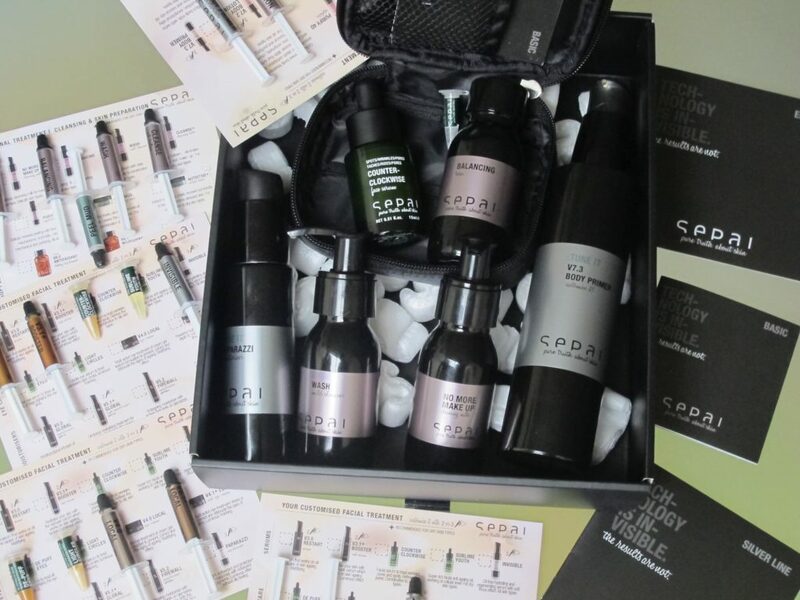 There is a variety of Sepai’s Starter Kits for you to choose from that are always useful in order to discover if you like the brand and ‘get on’ with the skincare products. To find out more about Sepai please go to their website, where you can also find their list of stockists here. You can find Sepai products in the UK on the recently launched Amazon Beauty platform here.